One of the biggest challenges I face in my travel logistics is trying to pack as much as I can into the smallest, lightest, most mobile kit available to me. Every job is different, every job has it’s own unique needs and challenges. If I stay focused on what I “need,” not what I “want,” I can continuously make my kit smaller and more tailored to each type of shoot. Two months ago I added the Mountainsmith Day Pack to compliment my often talked about Mountain Smith Tour packs. I have played with the Mountainsmith Day in various set ups, and as much as I enjoyed the bag I knew I was somehow missing the real niche’ of this bag in my day-to-day shooting. This past Saturday I decided to create a while new light versatile mobile kit based around the size and strengths of this bag. I wanted a shoulder bag that was light, but one that transfered the majority of the weight to my waist; one that could hold a significant amount of equipment and also give me more internal working room; one that could vertically transport a light stand and still not be a full sized bag. The answer to all these questions, wants and needs was obvious, the Mountainsmith Day Pack. To separate my lenses from my reflector and flag/gobo I used the Domke F-803 lens insert, this gave me a more stable working space. The lens insert also keeps my lenses & flashes organized while going through airport security, sitting in the aircraft’s overhead bins and obviously while out and about shooting in the streets of Philadelphia. With the Mountainsmith Day being considerably deeper than the Mountainsmith Tour I could fully insert my Canon 70-200f2.8L , with Nikon HN-28 metal screw in hood, into the main compartment rather than using an exterior Newswear Pouch. I still used my Newswear Pouch, however this was used to transport 2 Pocket Wizard Receivers, 1 Pocket Wizard Transmitter and a Calumet Swivel Adapter. Another change in how I approached this shoot was to not travel with my laptop. Normally I fly with a 13″ Apple MacBook, at times a 15″ Apple PowerBook, but I have been seeking to shed this item due to weight and size restrictions. I know I need a laptop the majority of the time, however on this day trip I decided to shed the excess size and weight of a computer. For entertainment on this day trip I brought a handheld Sony PSP with four movies on UMD disk. The UMD disks are smaller in diameter than the Canon EOS rear lens caps, and are roughly the same height as two DVDs (since the UMD disk is in a plastic protective case). I’d never used the Sony PSP before and really enjoyed it……….but that’s for another post. All in all for my day long trip to Philadelphia, two trips through TSA check points, packing the bag for flights on two regional jets and a few hours of packing and unpacking my kit on location while shooting I think this set up is fantastic. In the long run I can see this kit completely changing how I approach my short shoots. Below are a few detailed photos of the kit in the bag and laid out with the bag. The images below also show some detail shots of the Newswear pouch with the Mountainsmith Day; the Manfrotto 345 and it’s carry pouch attached to the Mountainsmih Day; the Domke lens insert and the Domke lens insert inside the Mountainsmith Day. I have also added a few images from the engagement session this kit produced. I would love to see what you could get into my Think Tank Airport Security (updated) ver. 2.0. 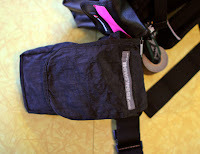 I am amazed at what I was able to get into my old Lowe Pro bag after reading and studying your blog. I shoot for ESPN and Bassmasters, and used to hate flying, you have help erase that fear, you hit the concerns we have head on. I now know I can keep my gear safe, and not have to drive all night to get to my next event, which gets me home to the family faster. See you in the terminals! I purchased the same bag per your recommendation and give you tons of credit for your packing skills! I like to put my camera bodies into the bad and becasue of this cannot carry as much as you do. Thanks for the blog and insight into making traveling life a bit easier!